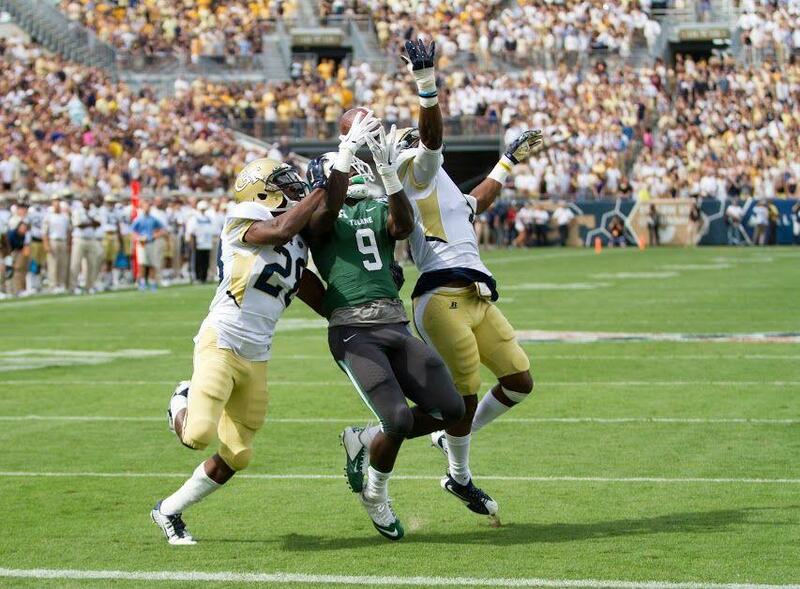 Tulane sophomore wide receiver Teddy Veal attempts to catch a pass against double coverage during its 65-10 loss to Georgia Tech on Sept. 12. After two consecutive losses, Tulane (0-2, 0-0 American Athletic Conference) hopes to score its first win of the season against Maine (0-1, 0-0 Colonial Athletic Association) 7 p.m. Saturday at Yulman Stadium. The Green Wave most recently fell to No. 14 Georgia Tech (65-10) in the first away game of the season Saturday. Tulane’s offense ran 248 yards compared to 271 against Duke on Sept. 3, while the defense allowed 571 yards. Saturday’s game will be the first meeting between the Wave and the Black Bears. “We’re going to cut back to the basics and do the things that we know and get some confidence in them and start winning some more games,” head coach Curtis Johnson said. Maine heads into this game after a Sept. 5 loss of 24-3 to Boston College. Saturday night’s game will test Tulane’s ability to return after two blowout losses. The Maine defense has potential to succeed due to players such as Christophe Mulumba Tshimanga, Trevor Bates and Mike Kozlakowski, who is returning from an injury after nearly two years on the bench. These players will anchor the front seven this season. Going against the Black Bears, despite being ahead in predictions, Tulane still needs a morale boost to edge past its previous losses. With the goal of simplifying the offense and streamlining plays to run the ball more efficiently, Tulane fans can expect seeing more of redshirt junior running back Lazedrick Thompson. Thompson paced the Wave with 74 yards on 13 attempts against Georgia Tech Sept. 3. The Green Wave hopes the Tulane student body will be there supporting them throughout this “white out” game and serve as the encouragement factor the coaching staff believes the team needs to hold on to. “This weekend we want to do a white out, and have fans come out dressed in white and just show support for this team and help carry us to a victory this week,” Johnson said. Saturday’s game will be broadcast live on ESPN3.